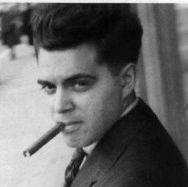 It's Jack Kirby Day at last! Somewhere in New York state King Kirby Ale is being sipped and Kirby fans all over the world are reflecting on all the wonder that The Great One has sprinkled onto their lives. I had planned to put a significant effort into drawing a nice Kirby portrait to commemorate the occasion like I did last year but (as usual) my account at The Reservoir of Spare Time was pathetically overdrawn and all I could muster was the two minutes it took to produce the well-meaning image seen above.